What Can I Talk About During Dinner? Determining how to choose great table topics during any dining experience may be a bit tricky. Depending on who your dinner guests are, different subjects may or may not be appropriate. It is no secret that most people (even the shy ones) like to talk about themselves, at least a little bit. Do the necessary research to show that you know a few things about your guests and use this information to begin a great conversation. For example: "Dr. Jewell, I understand that you spent several years working as a medical missionary in South Korea. That must have been exciting. What did you enjoy most about your experience there?" Now you smile and wait expectantly for the kind doctor to expound for several minutes about his time in South Korea. Other guests will no doubt ask other questions or begin to share their own some-how-related stories. Besides work, another great talking point is the family. Parents love to talk about their children, so asking questions about how they are doing is always a great option. The subject of pop culture opens up a plethora of options for your conversations. Just be sure to keep the conversation G-rated and fun. This may be accomplished by making statements about movies you recently watched or books you just read. Good magazines and travel locations are also great speaking points when it comes to conversations during dinner. Here are some starters: "I saw the best movie about baseball the other day!" "Has anyone read any good books lately?" "I was so happy to discover that the touring production of The Lion King will be coming to Illinois in March. Has your family seen the live production yet?" You should always endeavor to maintain an atmosphere that is classy rather than crude. Avoid scandalous news items and gruesome imagery such as homicide crime details and terrorism. Celebratory dinners and gatherings are intended to be entertaining and fun. Try to think of some times and memorable occasions that you and your guests share and recall them as a way of enjoying your company. Most people like to remember certain fun vacation or other events you have in common. For instance, if you all attended a special New Year's Eve ball last year, you might want to bring up some of the memorable experiences you had during the event. I wouldn't suggest pulling out photos at the table, but it is certainly appropriate to offer to show photos later of a certain place, person or event if your guests inquire. This can be done after you move from the table to the family or other gathering area. 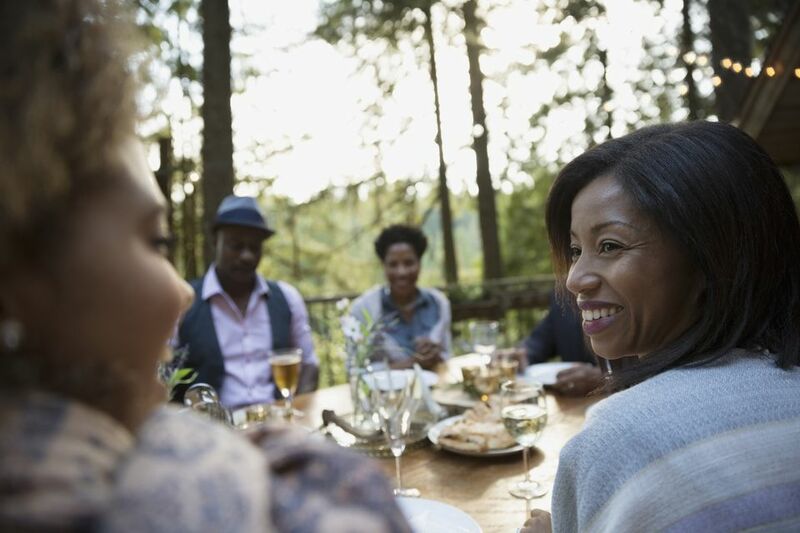 As the host or hostess you should look for opportunities to invite those guests who appear to be more reserved into the conversation and fun. Your role should be to facilitate the conversations rather than dominate them. You also don't want to appear as if you are interrogating or interviewing your guests. Phrases such as, "What are your thoughts on the subject, Aunt Rosalind?" will open the door and encourage those more reserved guests to weigh in on the subject at hand. And don't forget to listen. Your attitude and behavior are crucial to the success or failure of your dinner party event. You could say that with you it either rises or falls. If you are upbeat, positive, joyful and pleasant, you will go a long way toward putting your guests at ease. In a comfortable atmosphere your friends, family and associates will share and participate more freely than they would were you to seem stressed or tired. Be sure to get a good night's sleep before the party and receive your guest in a refreshed mood, prepared to have a great time of fellowship together.